Disinfotainment brings you another strange video from FujiTV (4 min, Japanese subtitles only) of interest primarily to linguists and Japanese language students. The subject of this video is gyarumoji, “girl’s characters,” and since these characters are mostly shown on small cel phone screens, much of this writing will only be visible to high-bandwidth viewers. But keep watching, some examples are visible in large print. I guarantee you will be able to read a bit of gyarumoji by the time you finish watching this video, even if you only have a 56k modem. Pay close attention and you may even notice that Cliche Kitty flashes across the screen! Teenage Japanese girls have a long tradition of making themselves incomprehensible to adults through the use of obscure slang and speech patterns. But lately, a new fad has arisen, the use of foreign character sets to represent hiragana characters. These characters were first used in text transmissions through cel phone messaging, but now has spread to other media. I have often argued that Japanese media corporations are commonly used to disseminate new language forms, and this video shows how the process works, through new technology, and through a novel use of old technology. We start our exploration in a trendy karaoke box in Shibuya, where several girls are singing along to karaoke subtitles written in gyarumoji. But first let’s go out on the streets of Shibuya and talk to a few girls, and see some gyarumoji users and how they send messages to each other. Our reporter locates a few girls who demonstrate the characters and we see a few real messages on their cel phone screens, with subtitles so we can see what the strange characters represent. The girls proudly declare that their mothers can’t read these characters, so our reporter sets out with a simple message in gyarumoji, konnichi wa (hello), and asks some adults if they can read it. They are all baffled by the strange writing. One of the young gyarumoji users even admits that she only knows 2 people who can read it. 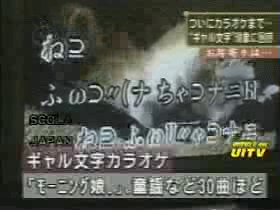 Let’s return to the karaoke box, and watch our reporter try to keep up with the strange subtitles. She is barely an adult herself, but the gulf of a mere few years has set her far apart linguistically from these youngsters. After fumbling with the lyrics, one of the young girls grabs the microphone from the reporter, and resumes singing with her exclusive cadre of girlfriends who are initiated into the intricacies of this incomprehensible writing system. Previous Previous post: Ginko Trees Must Die!